New Zealand-born, Paris-based pianist Aron Ottignon has been steadily expanding his instrumental craft as a jazz pianist – both on his own and in collaboration with artists such as Stromae and Woodkid. For his latest release, Ottignon sought out the production talents of fellow-antipodean Rodi Kirk, and enlisted UK steel pan and percussion virtuoso Samuel Dubois. The resulting “Starfish E.P.” is a kaleidoscopic ride through electronically-augmented, percussion-heavy 21st century jazz that also takes musical cues from a variety of non-Western music styles. Preparing the live presentation of the E.P. material, the challenge for the three musicians lay in recreating the intricacy of the studio recordings while leaving enough room for the spontaneity of a good jazz performance. For his part, Rodi Kirk arrived at a solution involving Push, a Tempest drum machine, a mixing desk, and a custom Max for Live device. Thus, with the electronic elements on equal footing with the piano and percussion, the trio now had ample room to maneuver within Ottignon’s dynamic compositions. 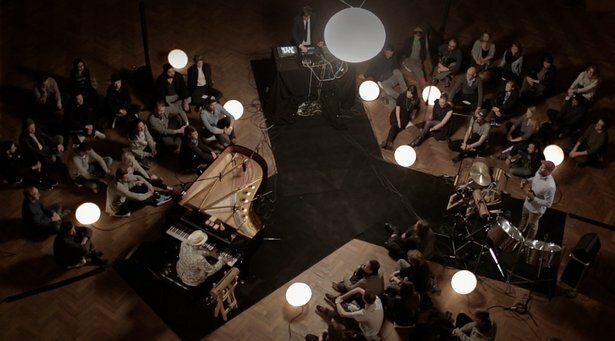 Ready to test themselves in front of an audience, Ottignon, Kirk and Dubois set up their instruments at the historic Funkhaus Berlin studio for an intimate live recording session, and our camera crew was on hand to document the whole performance. Check out their live take on the Caribbean-tinged track “Starfish”, and dig how the three players work together to build up an intense, interlocking groove full of spirited, in-the-moment embellishment. In our mini-documentary “A Question of Balance”, we follow Aron Ottignon, Rodi Kirk and Samuel Dubois as they take their music from the studio to the stage, and learn how they calibrated their setup for maximum musical freedom. In the video above, you can see how Rodi Kirk uses Push's User button to sample his bandmates' instruments in real time. You can do the same with this free Max for Live device which turns Push’s User mode off and makes the User button MIDI-mappable. Watch Aron Ottignon, Rodi Kirk and Samuel Dubois’ entire 30 minute performance from Funkhaus Berlin.